Ask RP Photonics for advice on how to optimize the parameters of a saturable absorber. 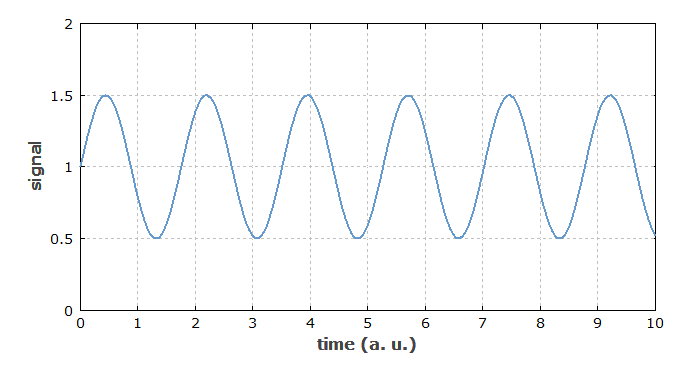 When a quantity such as the transmission of an optical modulator is sinusoidally modulated, the modulation depth can be defined as the modulation amplitude (i.e. one-half of the peak-to-peak changes) divided by the mean value. A modulation depth of 100% thus corresponds to a situation where the minimum value of the modulated quantity is zero, and the maximum is twice the mean value. Figure 1: A signal with a modulation depth of 50%. Here, the modulation amplitude is half the mean value. In the context of saturable absorbers, the modulation depth is the maximum change in absorption (or reflectivity) which can be induced by incident light with a given wavelength. This is an important design parameter in passively mode-locked lasers. A large modulation depth leads to strong pulse shaping by the saturable absorber, which can lead to a short pulse duration and reliable self-starting, but also to Q-switching instabilities.